With all the features of the Trunk box but with the added bonus of deep storage compartments hanging over the rear of the bike, the Quiver is the ideal solution for transporting electric fencing or longer tools. Manufactured from robust Polyethylene it is strong and durable, yet can be fitted to the bike in seconds. 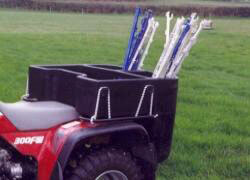 The deep compartments have no effect on the drawbar so a trailer can still be used.